Salve. I'm Gesalbte, a student from Connecticut, U.S. I with everyone could live in peace and prosperity. 4 What is "True Cross" in Latin? 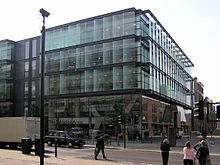 The Salvation Army International Headquarters, 110 Victoria Street, London. The argument "it works like that in one foreign language I know; therefore it must work the same way in another" sometimes fails. One of the things that makes languages so interesting. Exercitus Salvationis = "army of saving" clearly is not nearly as good latin as "Exercitus Salvificus" = "saving army"
Anyway, I wouldn't think that merely because "salvificus" is church latin that this would disqualify it for naming a specifically christian institution. It is clearly formed according to latin rules. And I hope you are not proposing to ignore all ecclesiastical latin in favor of "pure classical" words when describing christian/church related things! Likewise isn't ecclesia a christian latin word? Do you propose that we substitute some classical word for "ecclesia"?? I hope not! Oh, Well, I apologise for what I said which is ambiguous and has caused, maybe, a little misunderstand. It seems that I haven't blended in western culture very well..
And I was personally agree with Exercitus salvificus this translation, because it similates to something like Expeditio sacra..
Is it possible that is should be Sunt Proletarii Dominus Orbis? This odd inscription is found on a wood board in an old photo, and not very clear. Thus, I chech it again and feel it may be Proletarii instead of Proletaria. One way or another, it seems impossible that is reads as Proletarius. So it comes odd to me that why a pl. noun can be modified by an 'esse+single' structure? Salve. Well, in Latin, if we're saying that A(pl.) = B(sing. ), shouldn't we use the 'est' form of sum(esse)? E.g. Discipli classis V est globus bonus. / Discipli classis V sunt lusoris boni.? No, I'm wrong. The form of esse should be according to former one, not the latter. One way or another, it seems that the questioner doesn't will to have an translation of such an imagined english meaning at all. I've given the conclusion that the carving may be Sunt Proletarii Dominus Orbis. However, if you want to translate something as "Proletarians are the Master of the World", Proletarii sunt domini orbis terrarum could be a dremendous entity. But what does it mean exactly at all? Obviewsly that the proletarians are not ruling the world since ever and may not be able to do so in the foreseeable future. Could your suggestion latin phrase indicates that the proletarians create the world, thus they should be able to rule this world, otherwise, blablabla.. The best thing to do with Bradley's Arnold is to commit it to amnesia. It nearly killed Latin in the English speaking world. Dreadful book. By refering Classical Latin doesn't ordinarily accept two adjectives in a row, you mean that Aeroportus Internationalis Tochianus should be rectify as Internationalis Aeroportus Tochianus or something else? Then what if an adj. or a gen. is set before the noun it modifies? E.g. "ruber calix altus"? I'm wandering which kind of word order for heavy-modified nominal phrase is the most acceptable in classical latin..
Iacobus is right about the perferred word order, although I don't know how important to strictly follow the preferred order, especially for proper names of organizations. Your word order is not "wrong" but "wierd", emphasizing Shanghaiensis and Cooperationis, implying either that there is another such organization perhaps Cooperationis Consociatio Londoniensis that the writer is working to distinguish clearly or that there is another Cosociatio Shanghaiensis that you are trying to distinguish. Can't find the page, so I have to ask here. I'm sorry if this is kind of stupid. Salve, Dr.Neader~ Recently I translated a Anglice motto 'Our path leads to the Kingdom.' to Latina as "Cursus Nostra Ad Regnum Caelorum Versus. ", but I'm not sure whether it is applicable. So what's your sugestion..? Furthermore, are 'ducit' et 'fert' the 3rd personal singular number form of 'duco' et 'fero'? Now I've noticed that I formally paid less attention than I should to that the adjectives should be changed to the same gender as their nouns'. Little more about this point, in Subjective+Objective+Verb kind of sentences, should the objective switch to the same gender as the subjective's? E.g. Shall I say 'Mali(nt) fructus(m) sunt.' or 'Mali(nt) fructum(nt) sunt.'? Adjectives follow in gender the nouns to which they are attached. Nouns don't and can't normally change gender. Malus and fructus are both nouns. When the verb is "est" there is no object. You have a subject and a complement, both in the nominative case. When the verb is "est", the usually preferred word order is "A est B". About the gender..What gender should an adj. use when it attaches to 2 or more nouns? T T. Now I can only find Collins (Collins Latin Dictionary & Grammar)... up there I did it careless.. It should be 'filii filiaeque luces' or 'filii filiaeque luciae'? Novissima mutatio die 29 Aprilis 2017 hora 00:23 facta.